In Los Angeles, it’s not uncommon to find beautiful people lounging at members-only clubs on their lunch hours. It’s less common to find them slathering butter on a baguette, as Josie Maran is doing on a Thursday afternoon. 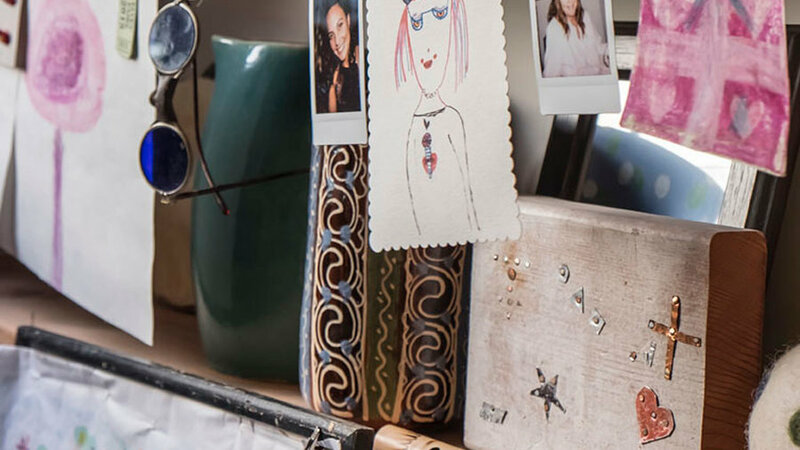 Even more unusual is the fact that the model-turned-mogul’s exclusive venue of choice—a stop squeezed in between meetings as CEO of her eponymous, eco-conscious beauty line—happens to be her mom Roberta’s house. 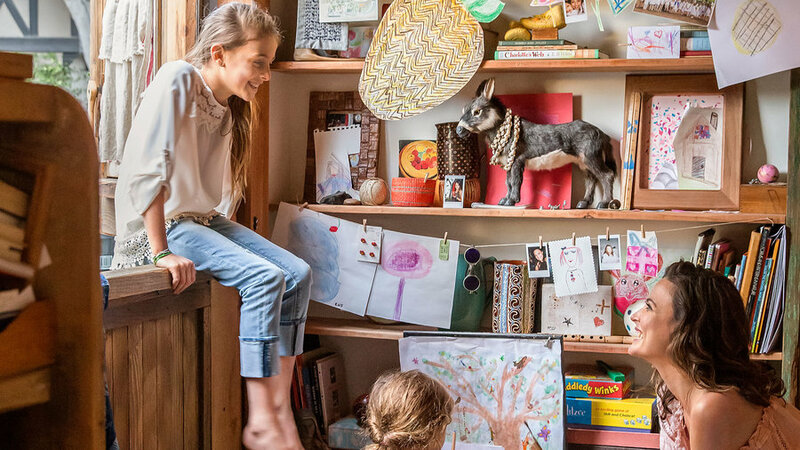 The 1920s-era Hollywood home is the preferred hangout of Josie and her two daughters, 3-year-old Indi and 9-year-old Rumi. It’s a warm, nurturing retreat where homemade plum jam is always on offer, “girl power” is the mantra, and Joni Mitchell’s “A Case of You” is on repeat. Josie is finding extra comfort in spending time with her family, having recently separated from her girls’ father. 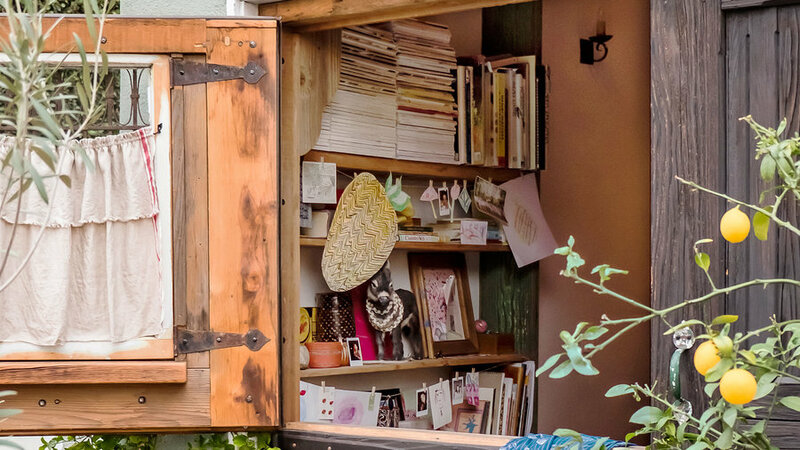 As she looks for a permanent place of her own, Roberta’s home, with its farmhouse-meets-flea-market style, is also a source of aesthetic inspiration. 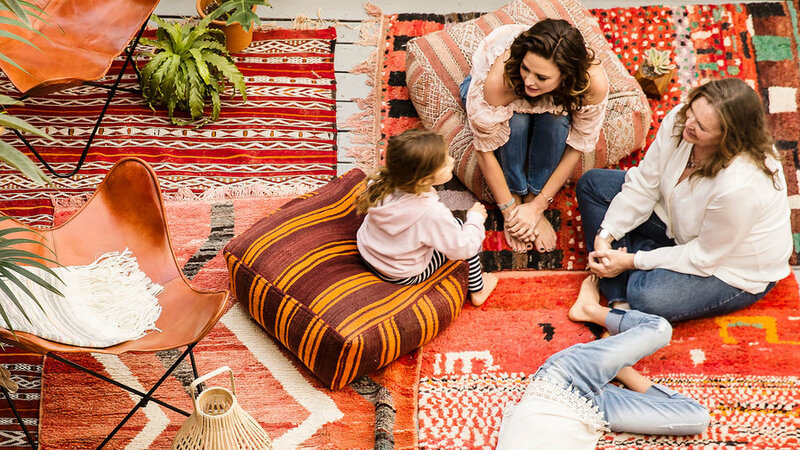 In the living room, a vibrant Moroccan rug from Dream Collective highlights an abstract painting Roberta found at an estate sale. 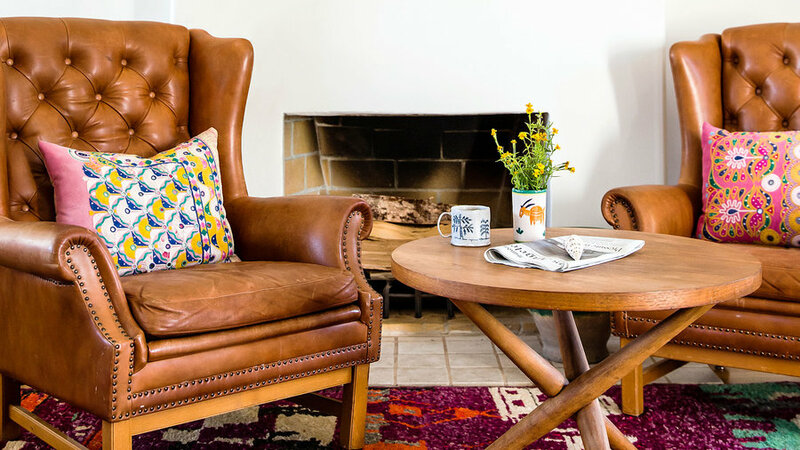 Leather wingback chairs and pillows from Nickey Kehoe. Roberta relocated here in 2008 from the Bay Area with Josie’s stepdad. The timing was right: Josie had had enough space to find her “momness” on her own after the birth of her eldest daughter, Rumi. “It was the best thing for me to have to be proactive, without a lot of support at first,” says Josie. 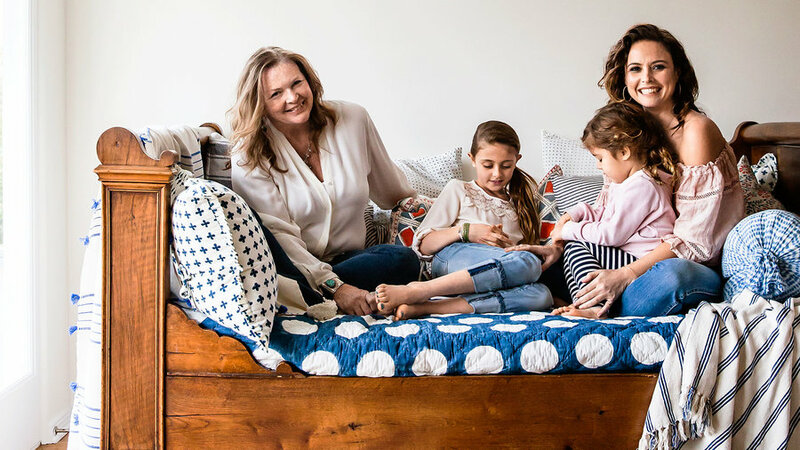 “But I definitely take a lot of support now.” Her girls stop by Roberta’s almost every day, helping Josie balance motherhood with her cross-country obligations as her brand’s on-camera personality (her skincare line is sold on QVC) and her commitment to social causes. The Maran women curl up together on a sleigh bed topped with a Reverse Dot/Belle Quilt by Les Indiennes. Roberta, in a top by Elie Tahari and Levi’s jeans, relaxes with Josie, Rumi, and Indi on her back porch, one of their favorite hangouts. Rugs from Dream Collective. Threshold Bamboo Lantern from Target. San Pedro throw and Palermo chairs from The Citizenry. Inspired by Josie and Roberta's free-spirited style, here's how to turn your deck or patio into a laid-back lounge. Just add rugs. A floor of overlapping floor coverings is just right for barefoot-living and channels an effortlessly cool vibe. To pull it off, pick a color (in Roberta’s case, it’s scarlet) and make sure it appears at least once in each rug. Sit high and low. Plan for a few levels of lounging, especially if you entertain, by -mi low-slung chairs and floor cushions. It will be easier to fit a crowd on your deck and invite lazy afternoon sprawling. Let loose. This mix-and-match look is forgiving, so take risks and pair colors or patterns you’d normally avoid. Stick with the color you chose for your rugs, or expand to a family of warm colors or cool colors to fast-track an attractive blend. Learn to love candles. It’s hard to beat the soft flicker of votives or tea lights when it comes to mood lighting. Place them in lanterns for safety and scatter them around your deck. Accessorize. Think of your deck like a room—it’s not finished until it has that final layer of plants, pillows, and throw blankets. If you live in a wet climate, do yourself a favor and use indoor-outdoor fabrics. But if it’s mostly dry where you are, feel free to rotate your indoor goods outside for a while. 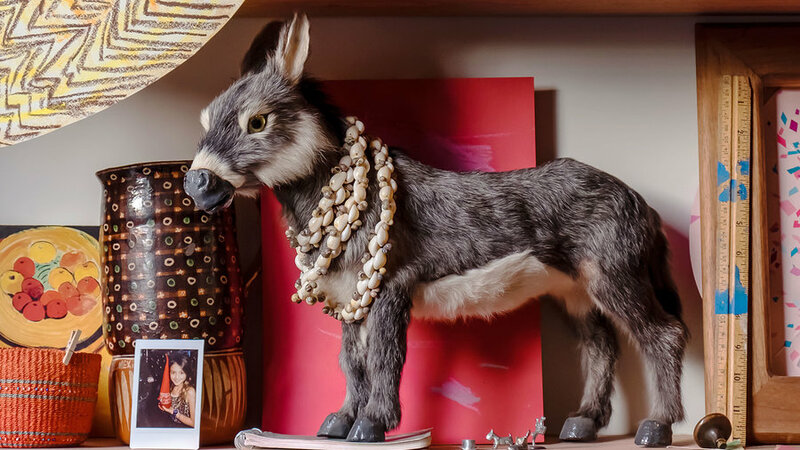 In her backyard atelier, Roberta displays family mementos and keepsakes, including a small donkey, one of many in her collection. “I just think they are way underrated,” Roberta says of her affinity for the animal (Josie describes it as an all-out obsession). Rumi, wearing a Monteau Couture top and Hudson jeans, perches on the Dutch door while Indi draws in the atelier, where shelves display Roberta’s vast 15-years-in-the-making collection of French magazine . 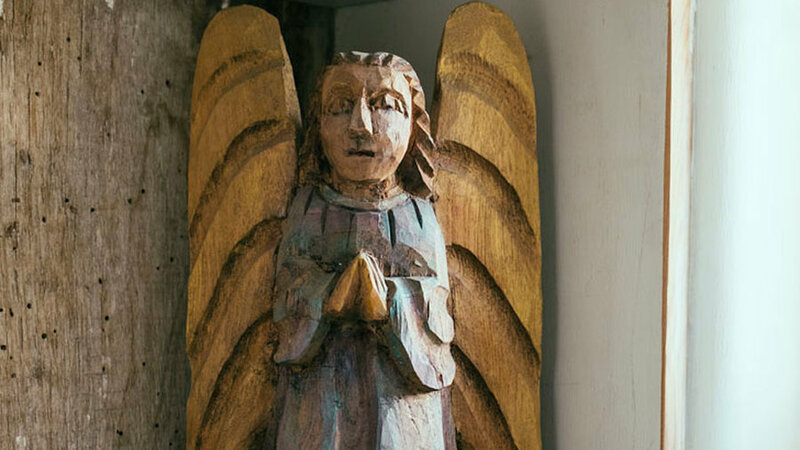 Roberta picked up this carved wood angel because it reminded her of her mom. Now it sits on the shelf of her atelier to pass on its good spirit. Indi and Rumi often decamp to the atelier to draw or work on projects with Roberta. Their work is proudly displayed with string and clothespins across the wooden shelves. Josie’s line of skincare and cosmetics led the way for eco-conscious personal care brands. “I design all of my products around food,” Josie says. 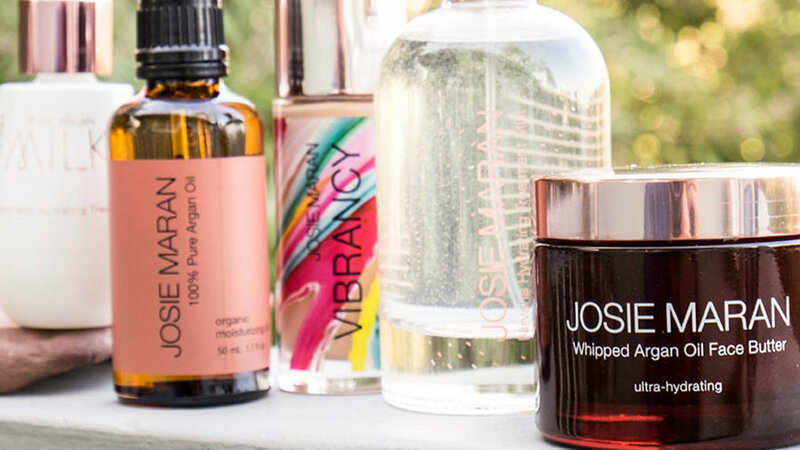 Her latest line is focused on rich, whipped and pure oil-centric ingredients. Through her brand, Josie also helps fund the Imagine program, an initiative that aims to empower women across the globe. She also recently invested in another organization, the Cool City Challenge. “It’s transforming cities to be more carbon neutral and sustainable; my company is funding three cities to prototype, and it’s going to be a game changer,” she promises. As she ramps up her involvement with these organizations, she plans to spend more time in the field. У нашей компании популярный блог на тематику заказать линзы цветные. Был найден мной полезный блог , он описывает в статьях про ежедневная уборка.